From time to time you’ll have a dark spot in your home without the space to have normal windows fitted to allow light inside. 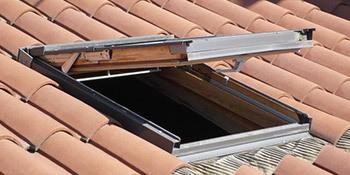 This is where Velux designed windows come in handy and this range of window is installed into roofs. Velux windows brighten up rooms and can be fitted into sloping and flat roof designs, making them perfect for lofts. These add plenty of natural light whilst also doing no harm to your home’s value. With the centre pivot window you can create a dramatic effect, which is not only easy to open but can be rotated 180º to allow ease of cleaning. When fully open this design gives a great view, creating extra headroom and allowing plenty of light into your home. These windows are very easy to operate and will even swivel in the frames, allowing ease of cleaning. For tall rooms where the windows will be out of reach, electric windows are ideal. They can be controlled from anywhere in the property and you can operate one or all of the windows at the same time. An added bonus is that a sensor will automatically close the windows if it rains. Flat roof windows offer the most for dark rooms and are popularly fitted into living rooms, kitchens and hallways. They offer practicality and bring aesthetic appeal with superb designs. You’ll be able to keep out the elements and control the windows electronically. They’ve become popular in new builds because of their attractive nature. If you’re interested in Velux windows to create light and aesthetic appeal for your home, complete our quick form and receive up to four FREE quotes from local, vetted and reputable companies. Project: Quote for a new attic window to be fitted. Previous one has been taken out and we require a new one to be installed. The below data demonstrates the energy performance of properties in Uk. Energy ratings range from A to G, with A being the most energy-efficient and G being the very least efficient. The Energy Performance Certificate (EPC) rating factors heavily when you want to sell your household, as prospective buyers will see just how much they're probably going to be paying for their heating expenses. Home upgrades such as insulation help you to drastically improve a home's EPC rating. There are many different types of property in Britain and the information underneath highlights the type of housing in Uk. Over the country the most common housing types tend to be semi-detached and terraced housing, but detached homes, flats and bungalows are also available. The information below provides an indication for the number of households in Uk that are central heated and non-central heated. Homes are heated by a variety of sources which indicate how costly yearly energy bills will probably be. Examples of central heating include gas, electricity, oil, solid fuel and LPG boilers. Changing the way in which your house is heated could see you with cheaper bills. The data below reveals the spread of homes heated by different fuels. Throughout the UK the most common by far and away are gas heated houses, followed by electricity and then oil. Biomass central heating boilers are also increasing in popularity, heated by environmentally friendly products including wood pellets or agricultural waste.|Houses in the UK are warmed by a range of fuels, such as gas, electricity, oil, solid fuel and LPG boilers. Each fuel has a varying cost associated with it and that means you may find yourself with less costly energy bills by altering how your home is heated. Even solar thermal panels are being considered by many people as a way to lower heating bills for the years to come.